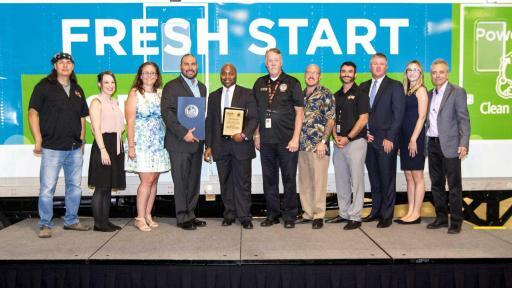 LAS VEGAS – JULY 28, 2017 – Las Vegas Sands Corp. (NYSE: LVS), and social enterprise Clean the World announced today a first-of-its-kind service in Las Vegas to help homeless people. 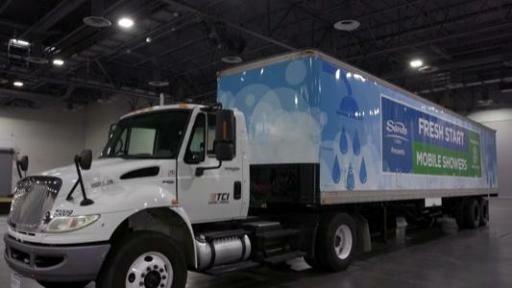 The Sands Cares Fresh Start Mobile Showers Powered by Clean the World is a traveling hygiene unit that visits locations serving the homeless to provide showers, hygiene supplies and other resources. 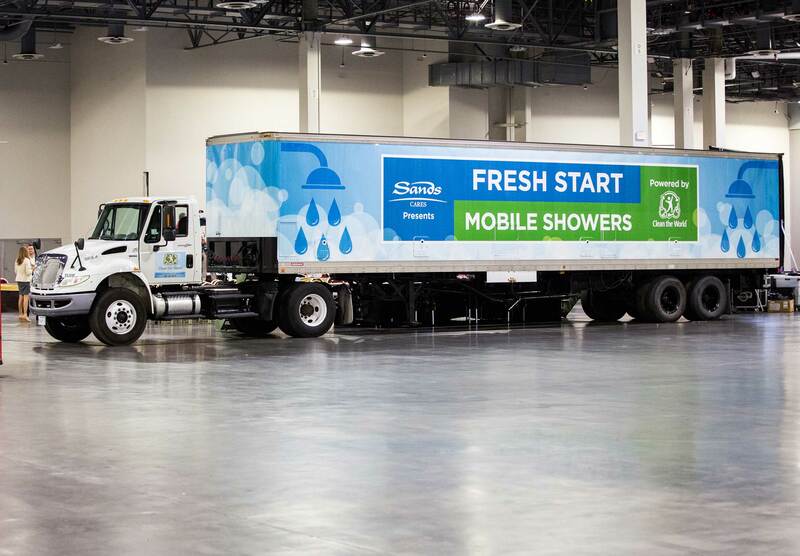 LVS contributed more than $200,000 to Sands Cares Fresh Start Mobile Showers, which was unveiled in Las Vegas on July 27, and will offer approximately 250 showers per week. 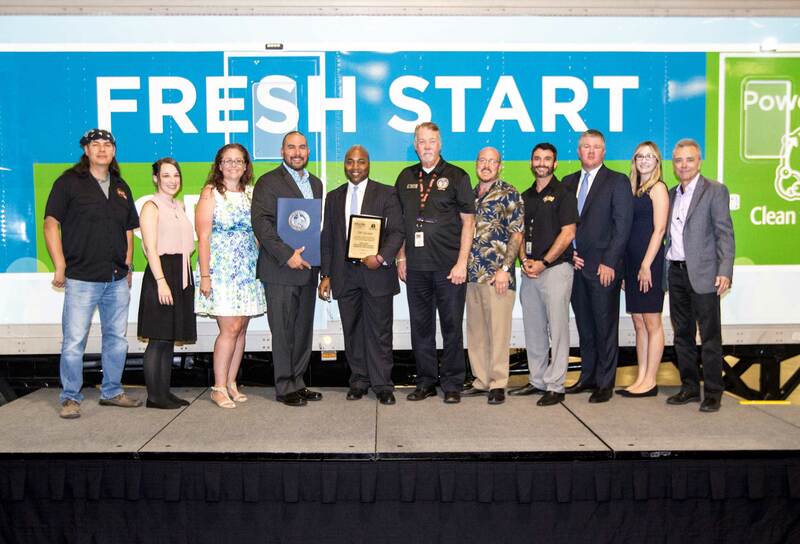 To reach people in need, Clean the World and Las Vegas Sands have partnered with four Las Vegas organizations to offer the service through their homeless community outreach efforts, including WestCare, CARE Complex, Nevada Homeless Alliance and the Nevada Partnership for Homeless Youth. 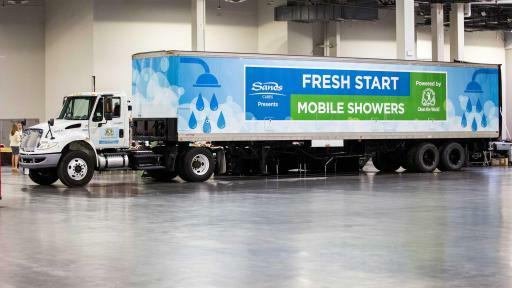 Sands Cares Fresh Start Mobile Showers will provide hygiene services at a partner organization one day each week, where clients can also receive access to a wide array of support, such as emergency shelter, food and clothing supplies, medical care and detoxification services. 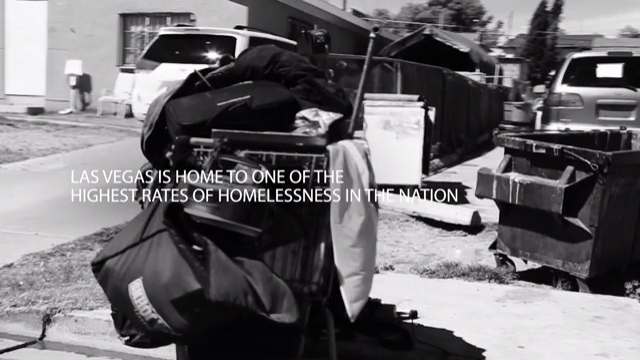 Las Vegas has a high need for homelessness relief programs. 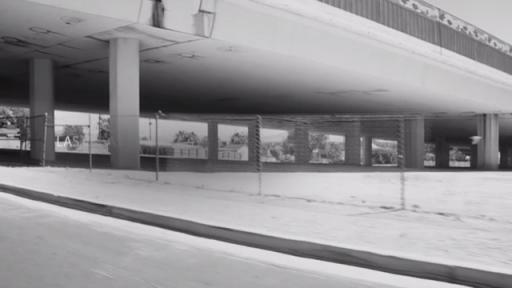 The U.S. Department of Housing and Urban Development (HUD) reports that Las Vegas has the sixth largest population of homeless individuals among major cities, and has the third highest number of unaccompanied homeless youth. In Nevada, more than 80 percent of unaccompanied homeless youth are unsheltered – the highest rate in the nation. In 2015, LVS began a multi-faceted program to address homelessness in Las Vegas through its global corporate giving program, Sands Cares. 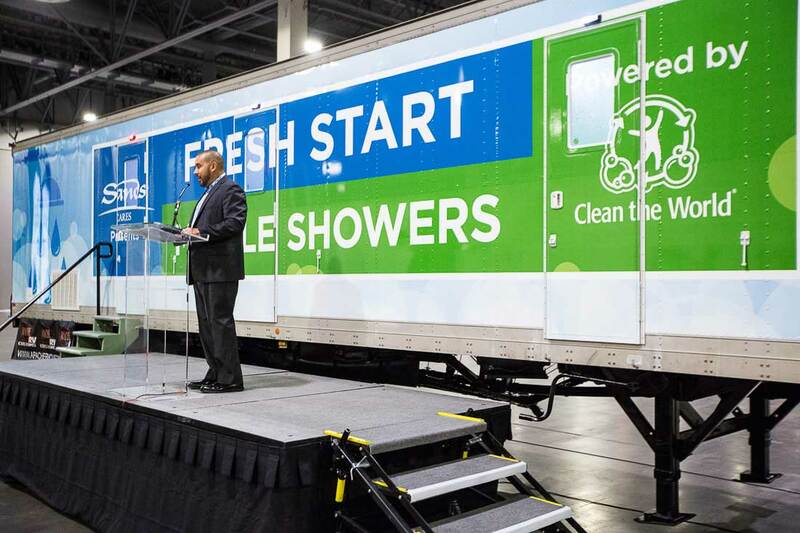 In addition to the support for the mobile shower unit, LVS has announced grants totaling more than $1.5 million over the past two years, as well as team member volunteer support, in three key areas; help meet immediate needs for those who are homeless, including hygiene, food and clothing and other resources; find solutions for the homelessness issue in Las Vegas and Southern Nevada; and increase awareness and advocate for homelessness support locally, regionally and nationally. 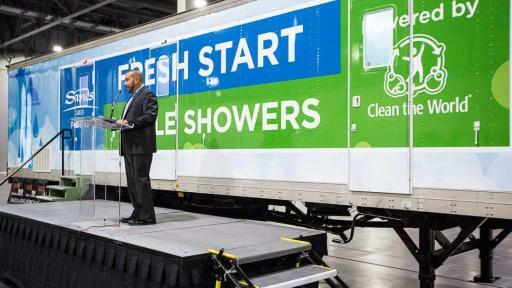 The introduction of the Sands Cares Fresh Start Mobile Showers is also a major expansion of LVS’ long-term support of Clean the World. Since 2011, LVS and Clean the World have recycled more than 488,000 pounds of discarded soap and amenities for distribution to underprivileged communities and relief organizations. LVS has donated nearly $2 million to accelerate CTW’s mission, helping the organization to double its production of recycled soap and expand service into new areas. Additionally each year, Las Vegas Sands team members around the world unite with local communities to assemble thousands of hygiene kits for Clean the World to benefit populations in need around the world, including those impacted by homelessness in Las Vegas. LVS is dedicated to being a good corporate citizen, anchored by the core tenets of delivering a great working environment for our more than 50,000 team members worldwide, driving impact through its Sands Cares corporate giving program and leading innovation with the company’s award-winning Sands ECO360° global sustainability program. To learn more, please visit www.sands.com. Clean the World is a social enterprise dedicated to the mission of saving millions of lives around the world while simultaneously diverting hotel waste from landfills. Clean the World operates soap recycling centers in Orlando, Las Vegas and Hong Kong, and leads a “Global Hygiene Revolution” to distribute recycled soap and hygiene products from more than 5,000 hotel and resort partners to children and families in countries with a high pre-adolescent death rate due to acute respiratory infection (pneumonia) and diarrheal diseases (cholera) – which are two of the top killers of children under the age of five. Since 2009, more than 40 million bars of Clean the World soap have been distributed in 115 countries. In addition, the Clean the World Foundation provides hygiene kits to relief organizations throughout North America and over 5 million individuals have received soap and hygiene education through its programs. More information: CleanTheWorld.org.